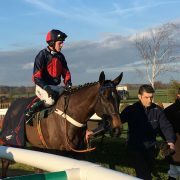 Whiskey Chaser was entered into the 15:50 William Hill – Bet On The Move Conditional Jockeys’ Handicap Chase at Towcester on the 29th January. After receiving the race declaration notification I decided that come hell or high water I would definitely make the trip to support him. Thankfully hell and high water didn’t prove a major obstacle to reaching the racecourse, although snow and blizzards looked like they might. The snow began to fall as my train pulled away from Chester, I was hoping that it wouldn’t be the ‘wrong type’ of snow, especially not the fluffy white kind which falls from the sky and seems to render our rail network unusable. My plan was to travel down to Milton Keynes and then onto Towcester by taxi. As the snowfall increased I began to get worried I might not make it. I needn’t have worried, my train rolled into Milton Keynes without any hiccups or delays. A black cab was hailed immediately outside the station and the driver informed me that it would be around £20 to Towcester and take about 15 minutes. 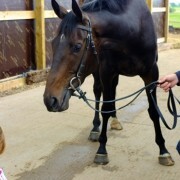 12 minutes later I was picking up my Owners & Trainers badge at the racecourse reception area. All in all it was a relatively smooth journey down. The taxi driver who dropped me off even asked if I wanted to be collected after the races? Which didn’t surprise me because £26 for 12 minutes work is good money in any business. Although the weather was bitterly cold there was no sign of the snow which had covered Cheshire earlier in the day. I’d arrived with a few minutes to spare before the first race and decided to place a quick reverse forecast on the two favourites. I got 4/1 and ten minutes later I was collecting my winnings with the smug smile of someone who’s just covered the cost of a taxi home. As this was my first time at Towcester I decided to mill around and check out the facilities, before heading into the owners & trainers bar to meet up with other members of the syndicate. The racecourse doesn’t charge an entry fee on most race days and the facilities are very good, if not better than many courses who do charge. The main stand is attractive and offers good views of the last two fences and the finishing post. Punters certainly get a better view of the jumps here than they would at Bangor-On-Dee or Haydock. Under the stand is a large bar area which is modern and well kept, the interior also features a tribute to jockey AP McCoy who rode his 4000th winner at the course in November 2013. I made my way outside again for the second race and instantly wondered where the previously sizable crowd had disappeared too? It was then I noticed it was snowing heavily, The crowd had taken refuge in the tent at the back of the main stand and I decided it was time to check out the owners and trainers facilities. Towcester provides a marquee for owners, it’s small but has everything you could need – a bar, tea and coffee facilities and hot and cold food. Although I didn’t have any of the food on offer but it did look great. The pie and mash proving a popular option judging by the number of people eating it. Prices are reasonable and more importantly the marquee was warm! I bumped into the other members of our syndicate just before Whiskey Chaser was due out in the parade ring. It had been a while since I last saw Whiskey Chaser in the flesh and I was mightily impressed by his appearance. 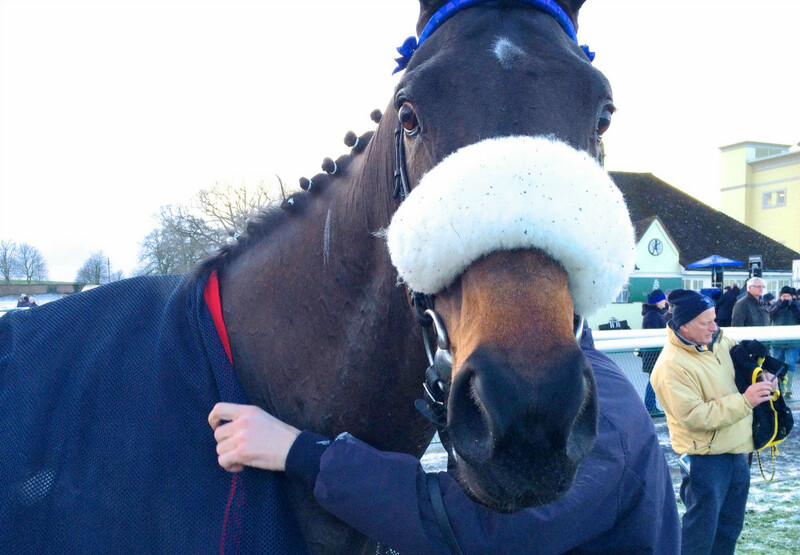 He looked immaculate and credit goes to the Bankhouse team for that. As always Whiskey Chaser is more than happy to oblige his owners with a few snaps before and after a race – He’s quite the poser and will stop and strike a pose whenever someone points a camera at him. James Cowley was our jockey on the day and he gave us an excellent pre-race briefing before mounting Whiskey Chaser and heading down to the start. Myself and the other owners decided to watch the race from the owners viewing area, but despite our best attempts we couldn’t find it, although we did crash a hen party in the process. 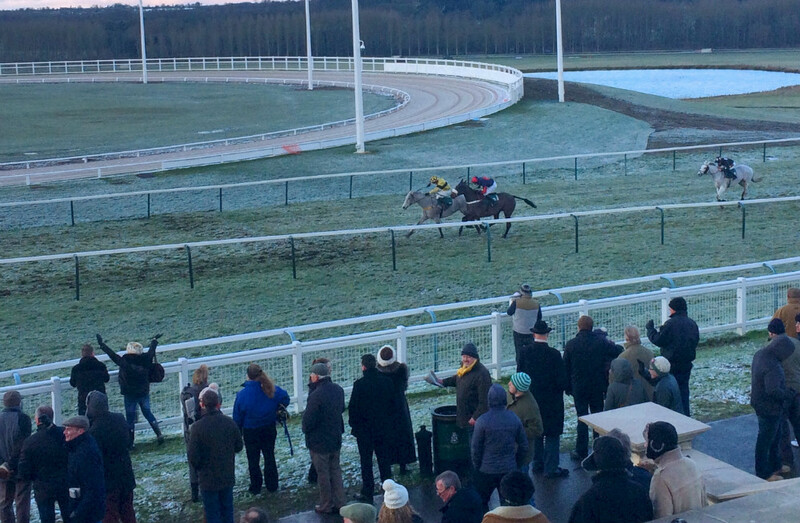 With time ticking away we decided it would be better to watch the race from the main stand, than risk being stuck in the lift as our horse romped home in first place! This race was just over two miles, a distance that should give Whiskey Chaser every chance to finish strongly. In his previous run over two and a half miles our boy ran out of steam in the final stages of the race. Although with the snow and poor conditions this race would probably feel like two and half miles anyway. At one point the snow was coming down so fast it seem more appropriate to remove our horses shoes and replace them with Skis. 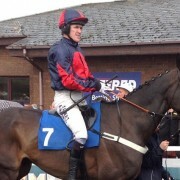 James Cowley and Whiskey Chaser post race. 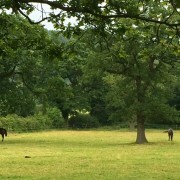 As usual Whiskey Chaser was up with leading pair almost from the off. A fluid round of jumping and he was whizzing past us in the stand and giving a good account of himself. He’s rarely out of a race at the halfway stage and even in the final third he’s often within touching distance of the leaders. 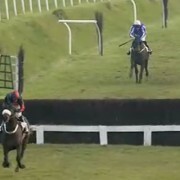 Today proved no different and as the runners turned for home he looked well positioned to place. 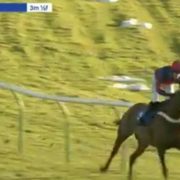 The home straight at Towcester is an energy sapping hill and it seemed for a moment that the sharp incline would take its toll on Whiskey Chaser. However, he stayed on well and was only a short head away from landing third place. 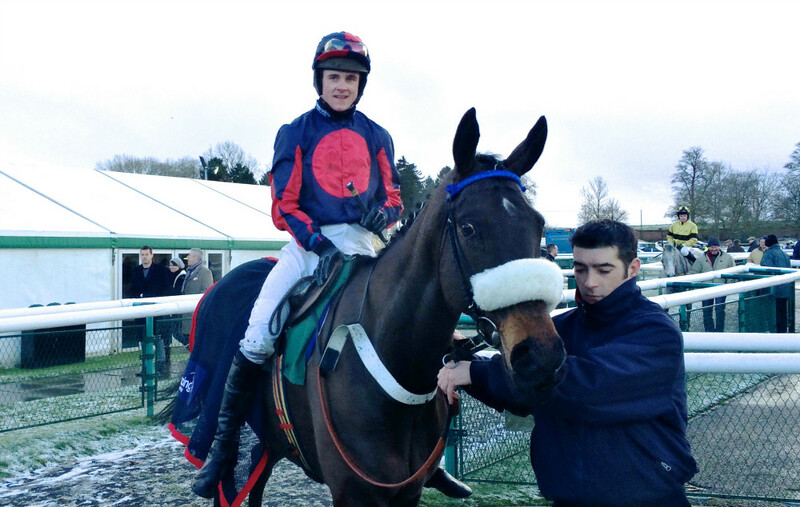 All credit to James our jockey who got him home safely in very tough conditions. It’s expected that Whiskey Chaser will have another run fairly soon. It would be terrific if he could manage a top three finish next time out – he came so close this time!